Welcome to Casa Botticelli! We could find a thousand definitions, from Hotel particulier in Florence, to Boutique hotel, to define this structure, but we like to present ourselves as a welcoming Tuscan family. At your arrival you will find Eleonora, the owner of the Galleria Botticelli, and all the highly selected staff, ready to meet all your expectations. The first service you will enjoy is the "extended reception", from 8.00 a.m. to 5.00 p.m. Roberta knows every single corner of the coolest neighborhood in the world, Oltrarno, and she will give you tailored advices on where to go, what to do and how to get the most of this special city, between sumptuous historic buildings and small streets, you will experience the fascinating atmospheres narrated by Vasco Pratolini... We can also book for you in advance the museums’ tickets or a guided tour: there are several ways to discover the most authentic Florence, let’s find yours! SLooking for some tips on shopping? Roberta and Eleonora can recommend the top artisans’ workshops, emerging designers boutiques, restaurants, kiosks, where to taste the typical street food (have you ever try a sandwich made by a “trippaio”? ), local markets, bars to taste excellent aperitifs and much more. The breakfasts will be served from 8.00 to 10.30, in the large common hall: enjoy a tasting of “farm to table” ingredients and products, fresh fruit by the farmers, foods from the shops of Santo Spirito, along with organic juices, a wide selection of teas, freshly baked brioches, a selection of cakes, yogurt, milk, cheeses and cold cuts and, obviously, the famous Tuscan bread. Here, in a corner, you will always be able to have a break with some artisanal sweets and biscuits, ideal for an afternoon snack, spend relaxing and reading one of the books and art volumes present in the library. How about some peaceful time in front of the fireplace, in the elegant setting of this intimate living room, tasting a glass of wine from our honesty bar? and, on request, the DVD player with a collection of the "special" films selected for you by Bruno and Eleonora, cinema lovers. And for anything else do not hesitate to ask, our goal is to satisfy your desires with our courtesy and kindness. 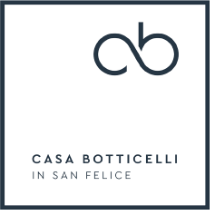 More than a hotel particulier, Casa Botticelli, the art of hospitality, emotions’ gallery.